We’d love your help. Let us know what’s wrong with this preview of Downfall by Jeff Abbott. Sam doesn't want trouble. An ex-CIA agent, She is a good mother. She will do what she must to ensure that her daughter Diana has a perfect life, just as perfect as the one they've led for the past seven years. 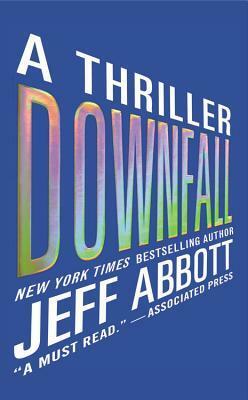 Downfall is the latest in the Sam Capra series by Jeff Abbott. It begins a few months later from the end of The Last Minute with Sam Capra still balancing his life as a spy/bar owner. He's fighting Mila at every turn to be a normal person that comes home to his young son every night and isn't constantly being in life or death situations. He's fallen into a sort-of routine until a young woman whispers "help" across the bar to him. That one instance changes the course of his quiet existance to a p Downfall is the latest in the Sam Capra series by Jeff Abbott. It begins a few months later from the end of The Last Minute with Sam Capra still balancing his life as a spy/bar owner. He's fighting Mila at every turn to be a normal person that comes home to his young son every night and isn't constantly being in life or death situations. He's fallen into a sort-of routine until a young woman whispers "help" across the bar to him. That one instance changes the course of his quiet existance to a person who's in a target for a very powerful man. Diana begins this novel with finding that her mother may in fact be hiding something from her when she finds three cell phones in her purse. Diana's mother, Janice, claims to be going on a retreat where phones are banished so Diana is automatically suspicious. After some amateur sluething, Diana finds info that Janice would rather her not know. This information puts Diana at risk. In an effort to save her self, Diana goes to Sam Capra's bar to find Felix, her mother's friend, but instead causes Capra to unleash the big guns and do his whole...um... spy thing. I actually enjoy the Capra character. I have read all the previous Abbott novels written in this series Such as Adrenaline and The Last Minute so I knew what to expect from this thriller. What I expected was action. Lots and lots of action. Abbott does a good job at maintaining the pace throughout this novel. There's barely time to for Capra to breath it seems. The characters from The Round Table, the secret organization that Capra is with, maintain their storylines from previous novels. I appreciate that Abbott gives snippets of information about regarding their past so that it is easy to read these as standalones. Also it gives people a refresher coarse on what they may have forgotten from previous novels. One other element to this novel I enjoyed was that many of the assassins from the opposing group The Network were just as human and well developed as Sam Capra. They all share a commonality that bordered on getting old because of how often it was mentioned, but still manages to make them worthy of sympathy. All except their leader seem less heartless. Although they have put themselves in their current predicament, I still felt bad for these people. Overall, Downfall is an interesting thriller that supplies more than enough thrills. Capra is still doing his parkour thing and his son is still his main motivation... from afar. I look forward to book 4 in the Sam Capra series. I will definitely be reading other Abbott novels. It's safe to assume I'm a fan at this point. And if I learned nothing at all from this novel except one this it is to never make deals with the devil. If the deal is too good to be true, it probably isn't true. I found this third book in the Sam Capra series confusing and implausible. The first two were great and I'm hoping the fourth will also be fast paced and intelligently written. I borrowed this audio book from the library because I want to study the writing techniques of thriller writers. It's not a great book for this purpose. I gave up after chapter 8. Up to that point the book fails to hint at what the bad guy's (Belias's) ultimate plan is. Belias is manipulating ordinary people and one former CIA-agent to kill for him. So far so good, but - why? I need something to look for, I don't want to collect puzzle pieces that will or won't come together at the end; especially I borrowed this audio book from the library because I want to study the writing techniques of thriller writers. I need something to look for, I don't want to collect puzzle pieces that will or won't come together at the end; especially when so many characters are involved. There is the CEO of a PR-firm, who has been diagnosed with invasive breast cancer and her daughter, the divorced couple who still have feelings for each other, and, former CIA-agent Sam Capra who is now a bar owner. All of them have children, Sam Capra's son is a baby, the CEO's daughter a 23-yr old young woman, Diana. I did not get far enough to find out how old the other kids are. All of these relatively ordinary people are "Belias' puppets" and do what he wants them to do to get out of whatever he has on them. Notice the "whats"? At the end of chapter 8 there is not even a hint where this plot this is going. All "victims" want to protect their children. Bad mastermind Belias prides himself to be a master psychologist who manipulates people. Actually, at the point when I tuned out the listener still does not even know if Sam Capra who gets tricked into working for Mila is also one of Belias' puppets but at least I hope that there isn't a second puppet master in this book. Until chapter 8 the reader/listener also can't even guess why Belias is able to blackmail all of them or what his ultimate goal is. That might be ok, if the rest of the presented plot weren't so ridiculous. Why would a "brilliant mastermind" like Belias pick a woman stricken with an aggressive cancer to be his hit woman? She might decide that her life may be too short to play somebody else's game. Why would he ask the divorced couple to kidnap a person that's important for his organization, if they have never kidnapped anybody before (the woman is a master thief but not a kidnapper)? The two might fail in their efforts (and indeed they do). Indeed, in the book, they had asked themselves the same and hired a Russian mobster to help with the task, only Sam Capra kills the Russian. Surely, if Belias is such a mighty bad guy he could find better suited kidnappers. This plot either has too many characters, or it introduces the overarching crime-concept too late. About the only thing that makes sense are the actions of the CEO's daughter Diana Keene. Listening to the audio book makes it very clear what's wrong with this plot. Narrator Kevin T. Collins does a masterful job reading the book, especially the Russian mobsters' lines. I traveled Russia three times, I can vouch for that narrator Kevin Collins gets the Russian accent right. Still, even though Collins does a marvelous job reading the book I did not like his reading of Diana's thoughts. There are just too many different people in his book. 3 stars till chapter 8. Maybe I didn't like the book because I did not read the two preceding books from Abbott's Sam Capra series. What would you do for wealth or power? Would you steal? Would you kill? Would you join a group of like minded people intent on amassing power, fame and fortune through the manipulation of events or the outright death of your business, political or familial rivals. Jeff Abbott's new Sam Capra thriller is essentially about the lure of such a Faustian bargain. The people who have made the deal with the devil are, in many ways, just trying to get ahead, but they do not care who they hurt in the proce What would you do for wealth or power? Would you steal? Would you kill? Would you join a group of like minded people intent on amassing power, fame and fortune through the manipulation of events or the outright death of your business, political or familial rivals. Jeff Abbott's new Sam Capra thriller is essentially about the lure of such a Faustian bargain. The people who have made the deal with the devil are, in many ways, just trying to get ahead, but they do not care who they hurt in the process. And they will do anything to get ahead. Diane Keene stumbles into Sam Capra's life because she has learned of her mother's Faustian bargain, and when Capra gets involved trying to save her, he comes to the attention of the evil Belias, the head of Keene's mother's network. Belias wants him dead, then wants him to join his network, then feels threatened and wants him dead again. The action is continuous as Belias and Capra hunt for each other and Capra's friends and Belias's people all get involved. There is back stabbing a plenty, murder, fights, and more killings. As noites quentes dão-me insónia. E com este livro era impossível largar a leitura. Não entra no top dos favoritos, mas gostei bastante deste herói e deste escritor. Como é uma série, vou ter de arranjar os outros para saber o que aconteceu antes. Muito melhor que os livros Pânico e Medo, que tinham sido experiências menos boas com este autor. Ex-CIA agent Sam Capra owns 30 bars throughout the United States and around the world but his favorite occupation is being father to his 10 month old son. One evening his is bartending and a young woman darts in asking for help as 2 men pursue her. Of course, he is going to help her and that causes him to get in the big middle of a situation where he digs himself even deeper. He and his handler Mira from the Round Table are pitted against a secret organization that seems to have unlimited power. Ex-CIA agent Sam Capra owns 30 bars throughout the United States and around the world but his favorite occupation is being father to his 10 month old son. One evening his is bartending and a young woman darts in asking for help as 2 men pursue her. Of course, he is going to help her and that causes him to get in the big middle of a situation where he digs himself even deeper. He and his handler Mira from the Round Table are pitted against a secret organization that seems to have unlimited power. The leader is fascinated by Sam's skills and wants to recruit him to join. DOWNFALL is the third book in the Sam Capra series and begins with ex-CIA agent, Sam, living in relative peace, working for The Round Table and enjoying his cover life as owner of a chain of bars across the States. He wants a normal life, and this is as close to it as he’s had in a long while. But his peace is shattered when a young woman fleeing two male attackers rushes into the bar and begs for his help. Sam leaps to her aid, and in the process kills one of the men. As well as bringing him un DOWNFALL is the third book in the Sam Capra series and begins with ex-CIA agent, Sam, living in relative peace, working for The Round Table and enjoying his cover life as owner of a chain of bars across the States. He wants a normal life, and this is as close to it as he’s had in a long while. But his peace is shattered when a young woman fleeing two male attackers rushes into the bar and begs for his help. Sam leaps to her aid, and in the process kills one of the men. As well as bringing him unwanted attention from the police and the media, this brings Sam to the attention of Balias - a master criminal who can make a person’s dreams come true, for a price. This constant raising of the tension made the story compulsive reading. DOWNFALL is an action thriller and so as you'd expect there are a lot of action sequences and fight scenes. Abbott is a master at the fight scene – they're dynamic and tense with a real cinematic quality, making the reader feel like they’re in the scene ducking the punches along with the characters. What I especially like about his books, and this one doesn’t disappoint, is the locations these scenes often take place in - for example a child’s bedroom in a suburban house (the child is at school) - creating a great juxtaposition and additional conflict between Sam's desire for domestic normality and the nature of his job. The third book in Jeff Abbott's high adrenaline series about Sam Capra is definitely one of his best. tight plotting, fast paced action that makes you feel like you're working hard and running as fast and as far as Sam and others not to mention all the fighting. I like to The third book in Jeff Abbott's high adrenaline series about Sam Capra is definitely one of his best. tight plotting, fast paced action that makes you feel like you're working hard and running as fast and as far as Sam and others not to mention all the fighting. I like to pretend i'm losing weight and getting in shape living vicarously through Sam. This is a book that should come with a warning sticker: Don't read in bed before trying to go to sleep because odds are you'll find the adrenaline contagious and will never fall asleep. Keep up the great work,Jeff. Last Tuesday I heard Jeff, of Austin, read from and talk about his new book over at BookPeople. Love love love Jeff Abbott. The main bugbear I had with the book was that there were whole days that I had too much on and that prevented me from doing any reading. His characters have depth and his novels are action packed. Like a lot of series with recurring characters, you really need to start with book one, but this novel is such that you gleam enough from the story to work out what has happened before. Sam Capra owns bars all around the world, when a young girl in distress stumbles into the Love love love Jeff Abbott. The main bugbear I had with the book was that there were whole days that I had too much on and that prevented me from doing any reading. His characters have depth and his novels are action packed. Like a lot of series with recurring characters, you really need to start with book one, but this novel is such that you gleam enough from the story to work out what has happened before. Sam Capra owns bars all around the world, when a young girl in distress stumbles into the bar he is currently working, and says help me, little does Sam know the consequences of his actions. Fighting friends and foe alike, Sam is soon fighting for his life and not sure whom to trust. Jeff Abbotts standalone books are excellent too, everyone well worth reading. The 3rd book featuring Sam Capra and it is action packed and reads like movie script. The characters are easy to love and hate depending on which character you are talking about. There are a lot of good authors and books out there but Abbott knows how to get your attention and hold it the entire length of the book. If you are a spy, thriller and/or adrenaline junkie you must read not only this but everything by Jeff Abbott. This is my first book by Jeff Abbott and it won't be my last. My heart pounded and my pulse raced throughout this thriller. It was very well written story with plenty of twists. The list of suspects for several murders was very long and kept the characters confused leading to the "thrill'. Sam is an appealing protagonist- this is the first book I have read of Mr. Abbot's Capra series. I will be looking for others. This installment is a wild ride as Sam takes on the shadowy puppet master of the fates of successful and powerful (because he has made them so) men and women. Twists, turns alliances and betrayals make this read a roller coaster ride. Definitely a thriller. Great thriller novel that kept me interested from beginning to end. I liked how Jeff Abbott was able to continue on with the story of Sam Capra in this novel. After the ending of the previous book I almost thought the story was over. Glad I was wrong. DOWNFALL is the best Sam Capra novel yet. I thoroughly enjoyed reading this story and can't wait to read more about Sam Capra in the future. This book is like an action movie in book form. Amazing, and very difficult to do right. It is the third in the Sam Capra series. I recommend reading the first two before this one - they are better read in order instead of alone. Another solid thriller. I think there was too much going on in this one though. It's like the author had all of these ideas and he wanted to cram as much as he could in this one book. However, I still enjoyed it and look forward to the next Sam Capra adventure. Loved it... Good fast moving action that the descriptions make easy to imagine... Just waiting on the next one. But Sam, go get Mila ! what a twist at the end. Read my review next week on Bookreporter.com. Outstanding third book in the series. I hope to see Sam Capra in action for many more years. Oh good lord this is a #3 and I haven't read 1 & 2?! I just picked this up at the library without knowing much about the author or the story but I like a good thriller. It didn't drawn me in right away but by Part 2 I was contemplating whether it was more important to go to work or finish this book (I compromised and went in late.) There's a lot going on here between the Belias Network and the Round Table and you don't really get great insight into either, perhaps the Round Table was explain Oh good lord this is a #3 and I haven't read 1 & 2?! I just picked this up at the library without knowing much about the author or the story but I like a good thriller. It didn't drawn me in right away but by Part 2 I was contemplating whether it was more important to go to work or finish this book (I compromised and went in late.) There's a lot going on here between the Belias Network and the Round Table and you don't really get great insight into either, perhaps the Round Table was explained in an earlier book. Sam Capra seems insanely young for the role he is intended to play here...owner of 10 international bars and also a super amazing ex-CIA operative capable of disarming people heavier and better armed than himself. He also has a 10 month old son who he adores but is unable to put his dangerous lifestyle aside for him. Considering this book takes place over a few days, there's an incredible amount of action...the problem is you have no idea who the good guys are. The book is fairly easy to read and the plot is okay. I found it was getting better and better and then the ending petered out and it didn’t feel climactic at all, which isn’t what I want from a book that’s over 500 pages. There are a few characters, some of which work better than others, but some which I found more interesting than the main character. It’s billed as a Sam Capra thriller but honestly, the story could have worked without him. The style of the author was…functional is probably the The book is fairly easy to read and the plot is okay. I found it was getting better and better and then the ending petered out and it didn’t feel climactic at all, which isn’t what I want from a book that’s over 500 pages. There are a few characters, some of which work better than others, but some which I found more interesting than the main character. It’s billed as a Sam Capra thriller but honestly, the story could have worked without him. To be honestly, I did not like the reader on this Audio. this is the first time this has happen and I am not sure how much it effected my opinion of the book. I really dislike Sam Capria. To me he was too impulsive and all most immature. The whole Janet and Diana affair made no sense at all. the only two characters I liked were Roger, who was killed off way too soon, and Holly, who was pretty limited but had potential. The book just was not something I could get my head around and I would not read To be honestly, I did not like the reader on this Audio. this is the first time this has happen and I am not sure how much it effected my opinion of the book. I really dislike Sam Capria. To me he was too impulsive and all most immature. The whole Janet and Diana affair made no sense at all. The plot line comes very close to things that seem to be bubbling up in this trumped up world we are in. Might be one reason I can't really embrace this series. Why am I reading them? Because someone gave me a few books way up the chain and I feel compelled, nay, waterboarded to read them in order (and I mean that in two ways) to read the ones on my bookshelf. I do think one thing that keeps me from liking these more is the narrator in the audio books. He's a bit child-like. Engaging storyline that I thoroughly enjoyed. I finished an audio version on a Playaway of this book. I was eager to find as many occasions as possible to put in the earbuds and listen. The narrator of this audio version was a good fit for the book. I anticipate finding audio versions (or printed versions if audio is not available) of the other Sam Capra novels! This one seemed a bit hard to follow, #3 of Sam Capra. Most of the bad guys are now dead.....I said MOST. This one concerns the deadly network of Belias who seems to want to control the world. There is Belias, Janice, Diana, Glenn and Holly, Felix (still confused about him), Mila, Jimmy, and others. This book was excellent. The action started from the beginning and lasted until the end.. It was filled with twists and turns. A very good read.I recommend this book!!! I chose this rating as this book kept me guessing from beginning to the end. I highly recommend this book. Jeff Abbott (born 1963) is a U.S. suspense novelist. He has a degree in History and English from Rice University. He lives in Austin, Texas. His early novels were traditional detective fiction but in recent years he has turned to writing thriller fiction. A theme of his work is the idea of ordinary people caught up in extraordinary danger and fighting to return to their normal lives. His novels ar Jeff Abbott (born 1963) is a U.S. suspense novelist. He has a degree in History and English from Rice University. He lives in Austin, Texas. His early novels were traditional detective fiction but in recent years he has turned to writing thriller fiction. A theme of his work is the idea of ordinary people caught up in extraordinary danger and fighting to return to their normal lives. His novels are published in several countries and have also been bestsellers in the United Kingdom, Australia, Ireland, and France.